MyTemapertama wordpress template is a simple and minimalist WP design. 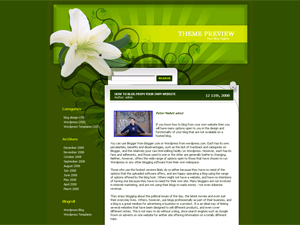 The background is some mixture of green and yellow and the theme has a big white-ish flower in the header. Other than that it’s all pure css and text. This is a 2 column wordpress skin with sidebar located on the right side. It supports wordpress widgets (remember to enable widgets in your blog’s admin area – under Appearance). Main content area is on the left and shows post snippets (excerpts). Links are orange while the text is black. That’s about all there is to this wp theme. 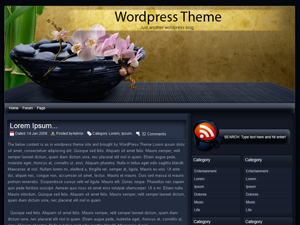 MyTemapertma wordpress theme was designed by Nahrizul Adib. Euphoria WordPress theme is a beautiful, pink two column WP design. 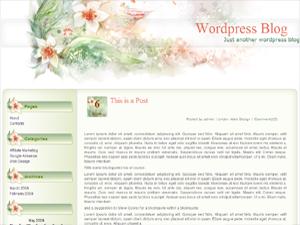 It’s suitable for a woman’s blog because of the cute pink flowers the theme contains in it’s header graphic. Pages menu is located just below the header, and below that there is a search box. The blog’s sidebar is possitioned on the left side and it supports wordpress widgets. Main content area is white (black text). The blog’s sidebar contains all the standard WP sections. 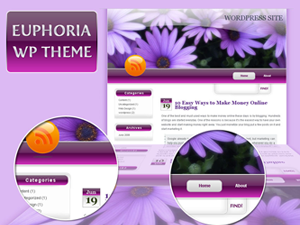 Euphoria wordpress template was designed by Lorelei. Waterlily is a beautiful two column wordpress template. It’s mostly dark – a combination of dark grey and navy blue color, with white text. 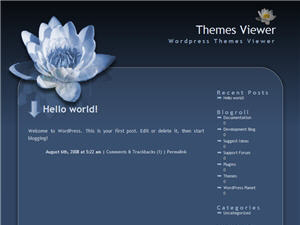 The WP skin has rounded corners and features a beautiful water lily in it’s header graphic (upper left corner). There is also a small waterlily just above the blog’s title in the upper right corner and another in the footer (bottom right corner). This wordpress theme was designed by Lisa Sabin. Dance in the Sun is a sweet rosy theme designed with a white base and a perfect blend of various shades of pink. The theme is has an orangish-pink colored header comprising of a graphical design of a beautiful pink colored rose with leaves on a variedly designed pattern. 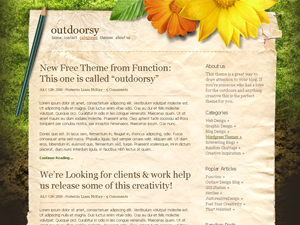 This is a fixed width two columned theme comprising of a distinct sidebar and large content area. The sidebar is dark pink in color with a pink patterned background and sharpened edges. The sidebar also comprises of a search area for the users. The content area of the theme is also distinct with a light pink colored base and displays the latest posts posted on the blog. 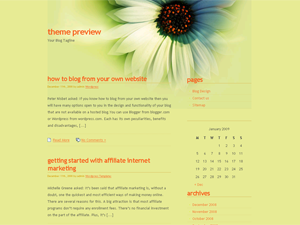 The theme is more suited for the various girly blogs. 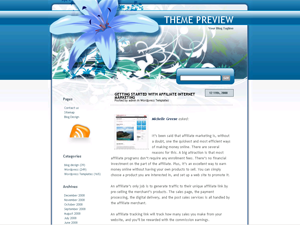 This sweet looking theme was designed by webhostinggeeks.com. An artistic looking wordpress theme, the JapaneseFleur is a two columned fixed width theme with a very attractive looking header. This green and white based wordpress theme has a large header with a distinct color scheme of green, black, red and white colors. The green colored header of the theme has beautiful floral designs in black and red color with the white based content area merging at its lower end. The header also has an authentically designed round edged search area for the users with black colored designs around it. The content area of the theme is large and displays the latest posts on the blog. The sidebar of the theme simply blends with the content area and comprises of sharp edged sidebar white colored sidebar titles with red colored contrasting fonts. This beautiful and artistic wordpress theme was designed by Lorelei and is perfect for any type of blog, especially art based blogs.